***Jon Stewart's got the Oscar gig again. The Comedy Central mainstay will host for the second time next year, sandwiching Ellen DeGeneres. "I'm thrilled to be asked to host the Academy Awards for the second time because, as they say, the third time's a charm," Stewart quipped, as he is wont. 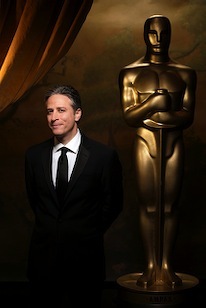 Stewart, in his ninth year as host of The Daily Show, also guided the 78th Oscar-cast. The 80th is set for Feb. 24 on ABC. ***Today it's NBC's Today. Soon enough it will be a return visit to her old home. Meredith Vieira will rejoin ABC's The View for a day on Oct. 8 after moderating the show for nine seasons. She left it in June, 2006 after being roasted and toasted by the likes of Joan Rivers, Kelsey Grammer and Mario Cantone. The View's new moderator, Whoopi Goldberg, recently took the chair vacated by bombastic Rosie O'Donnell. ***Fox's MADtv will open its 13th season with successive guest host stints by Jerry Springer (Sept. 15), Jeff Probst (Sept. 22) and Perez Hilton (Sept. 29). ***TNT's third season finale of The Closer set a ratings record for a basic cable series, drawing 9.2 million viewers. That's slightly more than half the 17.2 million viewers for The Disney Channel's High School Musical 2, which recently became cable's all-time record holder in any genre. TNT already has ordered a fourth season of The Closer, of course. And star Kyra Sedgwick is up for a best actress Emmy this Sunday. ***At the other end of the ratings teeter totter, HBO had a pretty dismal time of it Sunday night. The premiere of its very sexually explicit Tell Me You Love Me series aroused just 910,000 viewers. The network's extraordinary Alive Day Memories: Home From Iraq, produced and hosted by James Gandolfini, fared a bit worse with 901,000 viewers. Larry David's Curb Your Enthusiasm, starting its sixth season, upped those numbers only a bit to 1.2 million viewers. Also on Sunday, MTV's annual collision of posers, idiots and de-toxers, a k a the Video Music Awards, lured 7.1 million viewers. That's up from 5.8 million the previous year, thanks in no small part to a big tune-in for the opening debacle by Britney Spears. Best line on that one comes from Simon Cowell, who told Extra, "She stole the show, whether you liked it or not . . . I would think every other artist on that show hates her guts."